On our first day in Alaska, we took the early morning train from Fairbanks to Denali National Park. The biggest attractions of the park are Mt. Denali (a.k.a. Mt. 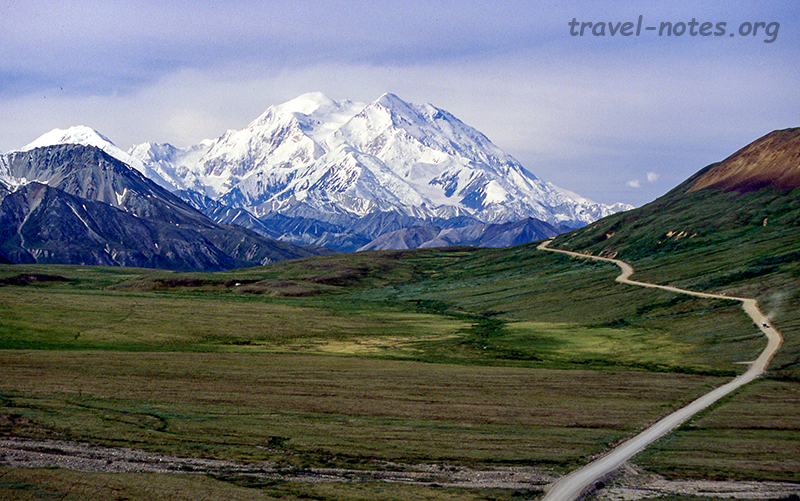 Mckinley, which at the height of 20,320 ft is the highest peak in the continent) and the wildlife. 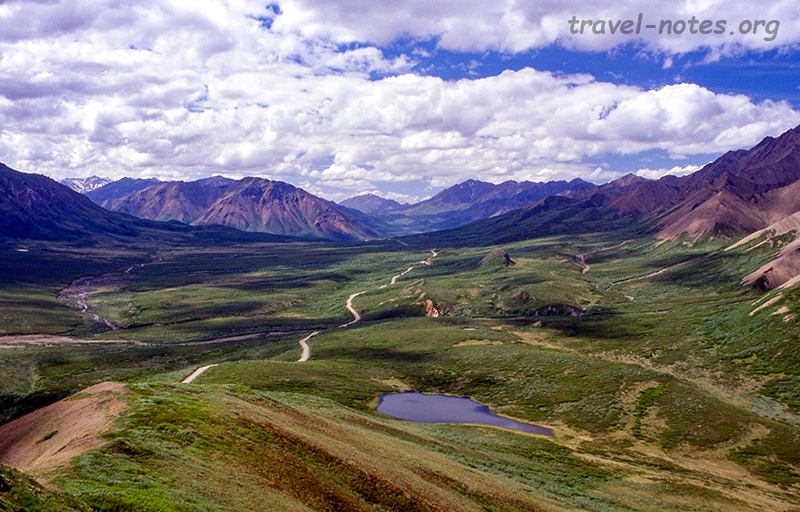 Although the authorities might lead you to believe otherwise, Denali National Park is no Serengeti and you don't bump into a grizzly at every blind turn. There are about 300 grizzlies spread out in 6 million acres. Add to that, Denali, the mountain, hides itself in clouds for 5 days a week and usually shows itself only in late evenings on the remaining two days. Hence if you are just doing a day trip, like the majority of the visitors to the park, you probably will come back seeing nothing but a few fattened squirrels at the visitor centres. Hence it is not surprising to know that less than 5% of the visitors actually see the mountain and even lesser number see any wildlife. Having said that, if you give yourself a week at the park, you probably will end up seeing enough of everything. Your chances improves dramatically if you camp instead of lodge in the park. In the Unites States, this is as best a chance of seeing wildlife as you can get. Everything in Denali comes with a price. The cost of attempting a wilderness, backpacking or a camping trip is to put up with the strange park rules. Denali has only one park road 90 miles long and park buses and shuttles are the only way one can travel beyond mile 20 on it. There are normal park buses, camper buses and lodge buses. Most of the park rules constitute a complicated method for determining the correct priority of seating when choosing between a camper, a backpacker, a day hiker, researcher, lodger and a day tripper in each of these buses. We had our first hand experience of these rules when we were made to spend 4 hours in front of the visitor centre waiting for the 16:30 camper bus while the half filled 13:30 camper bus refused to pick us up as we had not given them a 2 hrs advanced notice about the intended time change. What irked us more is that we could have caught the 13:30 bus if we had been careless enough not to do any prior bookings. After spending a surprisingly cold night, coldest on our trip, at the Savage River campground, we made it to the Wonder Lake campground around noon on the following day. Wonder lake campground is easily one of the most scenic campground in the world. The campsites are located on the slope of a hill and every single campsite has an uninterrupted million dollar view of Mt. Denali. 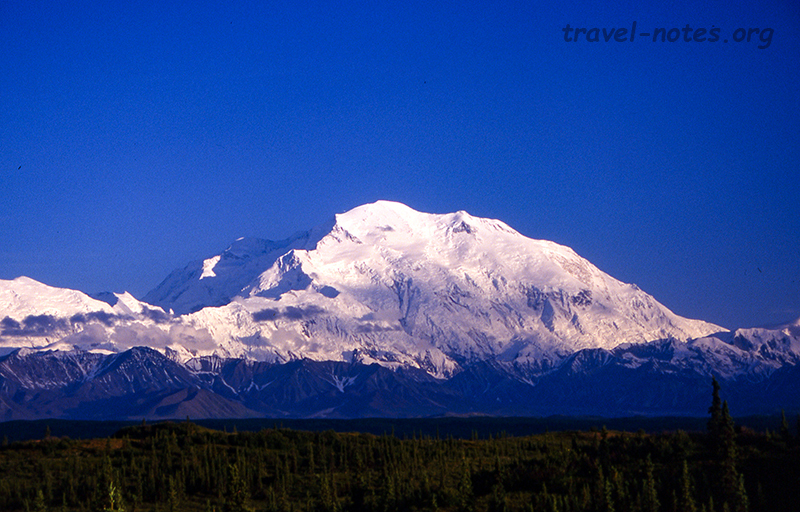 Denali is one of the coldest mountain the world and also has the second highest vertical rise from its base, second only to Nanga Parbat in the Himalayas. 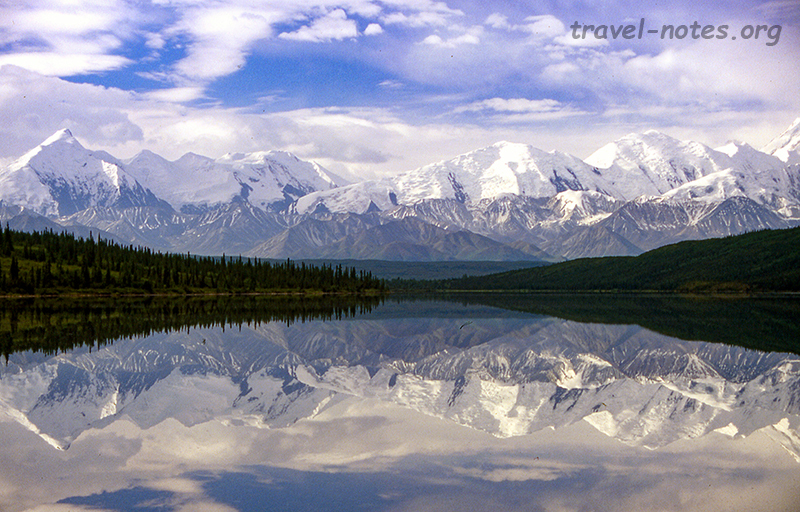 Hence the view of Denali is something that needs to be seen to be believed. For Wonder Lake, the price you have to pay for the view is your own blood! The campground has millions of blood sucking mosquitoes, so much that most of the campers here cut short their stay and leave the park early to more friendly neighbourhood. After drooling at the peak for sometime, we spent the rest of the afternoon walking on the Mckenzie Bar Trail, one of the few marked trails inside the park boundaries, which took us to the Mckenzie river to get a closer look at the Alaskan range. We spent the entire following day hiking near the Polychrome visitor centre. We hiked up the tallest peak behind the centre and enjoyed a spectacular 360 degree view of the colourful Polychrome Basin. That night we were fortunate enough to have extremely clear skies and we could see the Alaskan range its full glory. The next day, contrastingly, was a real mixed one. We started the day on the wrong foot when we (along with another group of two ladies) were booted out of the 7:00 am bus as it was filled with refugee campers fleeing from the mosquitoes. Why we weren't allowed to travel as standees for a half hour ride is still a mystery! After an hour and a half and 2 million bites, we were picked up by the next bus which unfortunately also had an extra one hour detour. The only positive to come out of the entire ordeal is that we got to spend a few minutes on the other side of Wonder Lake and enjoy a picture perfect reflection of the range on the placid lake waters. Our bad luck continued when we ended up choosing a bushy, buggy trail down to the Moose Creek mistaking it for the one which goes up Mt. Galen. Trail left us with lot of scars and lot of valuable lessons on tundra walking. Our day was however saved because we made it to the Eilson visitor centre in time to catch our first sight of Alaskan wild life. A grizzly sow was hanging out next to the visitor centre with her three spring cubs. Grizzlies are similar to brown bears only smaller in size. They owe their small structure to their diet. Grizzlies are 80% vegetarians as they dwell in regions with a dearth of fishes or game animals. Next day we left Wonder Lake for the final time to make our way back to the park entrance. Bearing with the mosquitoes is only a small price to pay for the location of this campsite. On the hindsight we feel that we should have spent all the five nights there. We were fortunate enough to get a closer look at more wildlife including the elusive arctic wolf on our final bus journey in Denali. This time we even had a grizzly cross the road right in front of us with its cub! Our final night was spent at the Riley Creek campground located at the visitor centre. After a hike up Mt. Healy, the best one among the selection available near the park entrance, we made our way back to the station to catch our train back to Fairbanks. The train journey, by the by, was nice, but wasn't very particularly breathtaking as we had imagined. On the hindsight we would have been better off hiring a car, which could have provided us a valuable transportation outside the banned limits and could have cut down on our travel time. Moreover the rent would have worked out to about the same as the ticket cost for the train. 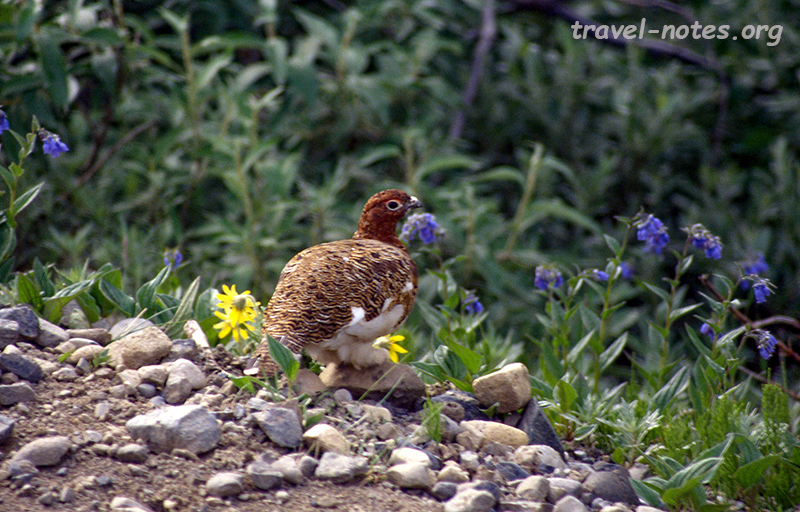 Click here for more photos from Denali National Park.